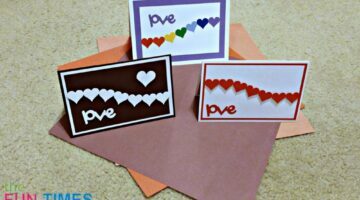 A card I saw on Pinterest inspired me to make my own version as homemade Valentine cards. 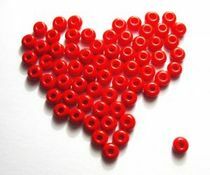 I created these 3 hearts cards which are great for sharing sentiments of love for Valentine’s Day, Mother’s Day, Weddings, and Get Well cards. Nothing says romance like black lace. That’s the look I wanted for this DIY wedding card. 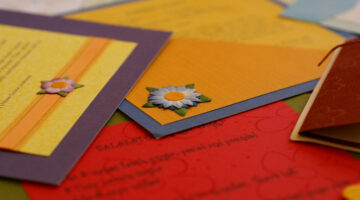 You can make handmade wedding cards like this using these tips. Some links to help you make fun wedding pages for your scrapbook. This elegant wedding card was created to match the wedding colors: red and black, and the theme: bling. It was a cinch to make and can easily be adapted for any occasion. Simply exchange the stickers or colors to match your event. 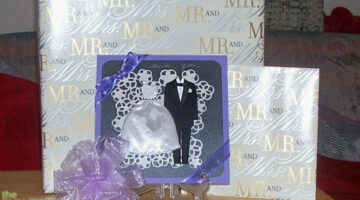 See how I made this wedding card. The stamped images on this card were embossed to give the card more dimension, as well as to keep the colors of the cake from running together.